I selected this article to showcase one of my favorite early bird watcher photographs and the lovely bird guide books I have collected. As I jump and run out the door with my credit card size camera to catch that hummingbird outside my office window, I think of this article. Warning to modern day bird watchers, environmentalists, naturalists, and photographers - this article may cause your heart to stop - and today many things discussed are against the law. Many of us will have collected birds' eggs at one time or another, and even now those of us who are growing old can scarcely resist the temptation to look inside each bird's nest we see, even though it be only to look, admire, and pass on. But as time elapses these memories become fainter, until we forget where it was we last saw such and such a nest, and this is where the use of the camera as a means of making permanent records of these treasures found on our rambles comes to the front. To my mind no branch of nature study is so interesting as that devoted to ornithology, but when combined with photography it is really fascinating. At the same time the photographing of birds' nests is by no means as easy as it might first appear, for it is fraught with pitfalls for the unwary novice, and even the experienced worker meets with failures; but then, on the other hand, there are no great difficulties to deter anyone who is possessed of a certain amount of patience. Further on I will try to give a few hints which may be of use in a material way to those who intend to take up this branch of work during the coming season for the first time, for there must be any amateur photographers who have up to now hesitated to launch out into nature photography solely on account of its alleged difficulties. I am not going to deny that there are difficulties; as I have just stated the work is fraught with pitfalls for the unwary, but at the same time there is absolutely no reason why any amateur should not become a successful student, and I would therefore urge all who have a stand camera and a real love for nature to go in for nature photography with no thought of failure. In these notes I propose to deal only with nests and eggs, for it is usual to become proficient in the art of photographing these before attempting to take their owners. . . The question arises as to how large the nest and eggs shall be made to appear in the photograph. Sometimes one sees pictures where the eggs and nest occupy the whole of the plate, and where even part of the nest is cut out. These are all right for showing up the markings of the eggs, but for all other purposes they are useless. It should invariably be the worker's aim to show the situation in which the nest is found, or at all events something of it if at all possible. For instance, if you are photographing a nest in a clump of sedge, let it be seen at once from the photograph that the nest was built in such a position. 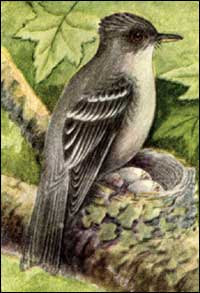 Another point with such pictures is that they invariably look well when converted into lantern slides and thrown upon the screen, whereas a simple picture of nest and eggs enlarged many hundreds of times rarely appeals to anyone. In the case of nests of such birds as hedge-sparrows, song-thrushes, blackbirds, etc., which build in hedges, it is often necessary to move some of the surrounding vegetation, in order to get a clear view of nest and eggs. Bear in mind, however, that branches and twigs should never be cut off, but simply tied back, and released after the picture has been secured. It will be seen that a supply of twine will come in handy. Another point to guard against is the tilting of the nest in order to expose the whole contents. Never do this, for unless the nest be built on the ground, it is better to show only two or at most three of the eggs. By tilting the nest it not only renders the eggs liable to fall out, but also spoils the beautiful symmetrical outline, and consequently the photograph would not be true to nature. And it should invariably be the worker's aim to show things exactly as they are in nature. . .
Hanley, Benjamin, Birds' - Nesting With A Camera. The Amateur Photographer's Weekly. May 1916. pg. 463. Reed, Chas. 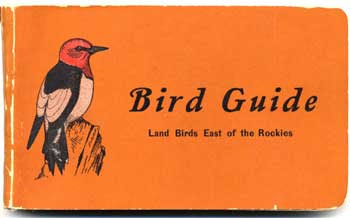 K. Bird Guide, Land Birds East of the Rockies. Reed, Worcester, Mass. 1905. 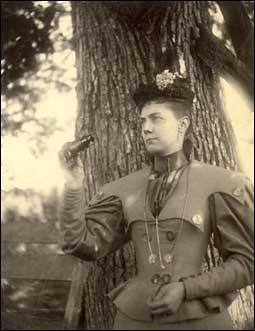 Woman Sporting Dress With Field Glasses. Photograph (card mounted). Unknown. Privately held by the footnoteMaven, [ADDRESS FOR PRIVATE USE,] Preston, WA. 2008. Unknown (Preparing Breakfast). 1905. Bird Guide, Land Birds East of the Rockies. Chas. K. Reed. Mass. 1905. pg. frontpiece. Unknown (Land Bird). 1905. Bird Guide, Land Birds East of the Rockies. Chas. K. Reed. Mass. 1905. That is a wonderful photo of the lady with field glasses! July 25 - And The Guest Author Is . . .